Add milk and keep stirring over low heat. Use a silicon spatula so that it doesn’t damage or scrape non-stick coating on your pan. Add cheese and cook until it melts over very low heat. Season with seaweed salt and pepper. Set aside. 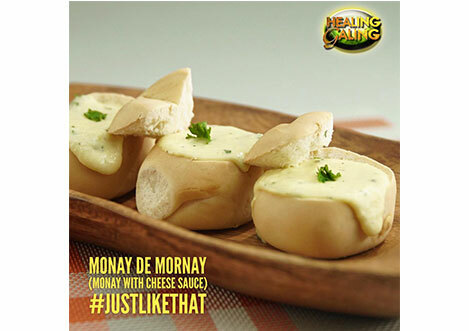 Make a bowl or small cups with your monay bread. Pour cheese mixture over bread cups. Option: if popping on an oven toaster, brush the bread with some milk on the side so it doesn’t dry up. Top with fresh parsley or fried malunggay leaves as garnish.